The three major Axis powers — Germany, Japan, and Italy — committed a host of catastrophic errors during the war. But some of these miscalculations were considerably worse than others. Here are the most significant blunders made by the Axis during WWII. Above: German soldiers fighting in Russia. Late last year we told you about the 8 worst mistakes made by the Allies during the war. Time now to turn our attention to the most serious mistakes made by Axis planners. The list, which is ordered (somewhat) chronologically, addresses planning and strategic errors rather than operational ones. Mussolini was unhappy in the summer of 1940. Sure, his German counterpart and trusted ally had just conquered France — but he was desperate to get in on the action and not miss the bus. What's more, he wanted to prove to Hitler and the world that Italy was the real deal. To that end, Mussolini unilaterally decided to invade Greece. "Hitler always faces me with a fait accompli," he confided to his brother-in-law, "This time I am going to pay him back in his own coin. He will find out from the newspapers that I have occupied Greece." The campaign commenced on October 28, 1940, but things did not go well. The Greeks immediately counterattacked, forcing the 530,000 Italian troops back. In March 1941, a subsequent Italian counterattack likewise failed. Embarrassed for his Italian ally, and eager to see the situation settle in the Balkans, Hitler came to the rescue, culminating in the complete defeat of Greece on April 23, 1941. But the damage was done. Germany was forced to commit troops during a time when it could ill afford to do so. It forced Germany to delay its attack on Russia by five weeks — a precious amount of time that could have precluded the Wehrmacht from having to fight during the Russian winter. Indeed, Hitler was inclined to agree during the last days of the Reich, blaming Mussolini for the delayed attack on Russia, and Germany's subsequent defeat. Not all historians agree with this assessment, but some contend that, at the very least, it prevented Germany from consolidating its position in North Africa. Called Operation Barbarossa, it was the Führer's time to jump the shark. Seeking to fulfil Germany's "destiny" in the East, Hitler was hell-bent on claiming the vast Russian territories for himself, while purging it of both Bolshevism and other "undesirable" elements — namely Jews and slavs. Convinced it would be a walk in the park, he brushed aside military intelligence's warnings, saying, "We have only to kick in the front door and the whole rotten Russian edifice will come tumbling down." Nazi Germany, drunk on its recent success in Poland and France, and further motivated by Russia's embarrassing defeat at the hands of Finland, decided to make its fateful move. The ensuing attack on the morning of June 22, 1941, was the largest military confrontation in human history, creating a front line that extended 1,000 miles (1,600 km) from north to south (practically the distance from Seattle to Los Angeles). At the outset, the operation involved three million Axis soldiers (across 117 army divisions), 3,580 tanks, 7,184 artillery guns, 1,830 planes, and 750,000 horses. In defense, the Russians amassed 132 army divisions, including 34 armoured divisions. The attack, which would have been visible from space, began well. A little over two weeks in, some 300,000 Russians had been captured. But then, in a fatal miscalculation, Hitler paused to divert forces from Army Group Centre to the south towards Kiev. The delay proved disastrous, stalling the attack on Moscow and forcing the ill-equipped German troops to fight in one of the worst Russian winters ever recorded. Germany never recovered. The Wehrmacht was not able to sustain its pressure on Moscow, instead fighting, and eventually retreating, from all Russian sectors. By late 1941, the Japanese Empire had found itself in an untenable position. Its hyper-expansionist policies and steady encroachment into the South Pacific and southeast Asia made it vulnerable to ongoing military confrontations and economic sanctions, including those from the U.S., Britain, and the Netherlands (the U.S. ceased oil exports to Japan earlier that year). What's more, the U.S. was actively providing military aid to China. At this stage in the war, Japan had two options: either pull out of its recently occupied territories (including China) or grab new sources of raw materials in the resource rich European colonies of Southeast Asia. Japan, like its Axis ally earlier in the year, decided to push ahead despite the odds. And indeed, projections showed that the U.S., should it enter the war, would eventually be able to regroup and trounce Japan. Japan's military leaders rationalized that a major offensive in the "Southern Resource Area" (the Japanese term for the Dutch East Indies and Southeast Asia) was necessary to secure the much needed rubber and oil. To stave off the Americans, Japan planned its attack on Pearl Harbor. The operation was intended to destroy important American fleet units, buy Japan precious time as it mounted its Southern Operation, and strike a severe blow to U.S. morale. When the infamous attack came on December 7, 1941, the Japanese achieved a limited victory; American aircraft carriers were out at sea on exercises and were untouched by the assault. These same carriers would strike a crushing blow to the Japanese fleet a mere six months later at the Battle of Midway. But more to the point, the U.S. was officially in the war. The Japanese could not handle the ensuing onslaught, nor could it keep up with U.S. production rates. Or its level of technology, as witnessed by the dropping of two atomic bombs in 1945. It's an open question as to whether or not the U.S. would have entered the war against the Japanese had Pearl Harbor not happened (say, after an invasion of the Philippines). It's safe to say, however, that a strategic pull-back (and not even necessarily a large one), rather than a major offensive, was Japan's most prudent course of action. But it was a lesson the Japanese would never learn, as witnessed by its perpetual over-extension in the Pacific, a problem exemplified by its catastrophic defeat at Guadalcanal in early 1943. After the attack on Pearl Harbor, the United States declared war on Japan, but not Germany. Indeed, while the US continued to supply Britain with much needed supplies, a ground war involving US troops on European soil was not a given. The anti-interventionist movement in America was still alive and well, as witnessed by the ongoing popularity of folk hero Charles Lindbergh. Not content to let a sleeping dog lie (or at least a snoozing dog), Hitler declared war on the US on December 11, 1941 — three days after Pearl Harbor. But according to the Tripartite Pact, Germany was under no obligation to do so. It just promised to help Japan if it were attacked. Recognizing this, German Foreign Minister von Ribbentrop stalled for time when, on December 8, Japanese Ambassador Oshima demanded that Germany declare war on America. Ribbentrop, rightfully, recognized the untenable position Germany would find itself in by doing so. But Hitler disagreed. He was concerned that the US would get a head start and simply declare war on Germany anyway. He may have also felt a sense of obligation to his Axis ally, fearful of a potential falling out. Moreover, he thought Japan would give the Americans considerable trouble — perhaps even defeat then. With the US out of the way, the Japanese could then join Germany in their common struggle against Russia. But as subsequent events revealed, this was not meant to be; entry into the war morphed the US into a superpower, providing the much-needed punch to the Allied effort. Germany produced all sorts of wonderful gadgets during WWII — except the one that mattered: The atomic bomb. While the United States, Canada, and Britain worked on the Manhattan Project — a massive endeavor involving over 130,000 people and costing some $2 billion (the equivalent of $26 billion today) — Germany failed to follow suit. Its nuclear project was disjointed and poorly supported. The Nazis failed to appreciate the finer details of theoretical physics, something it associated with "Jewish science." At the same time, Hitler was obsessed with the so-called wonder weapons — the V1 and V2 rockets (a precursor to intercontinental ballistic missiles), jet aircraft (which was not a bad idea, just not a decisive one), and massive tanks. Indeed, on this last point, Hitler was insistent that Germany produce extremely large tanks. This created considerable strain on the already overstretched tank production industry, and a drain on much needed material to produce working tanks. Hitler got this idea from Eastern Front reports about Russia's huge, almost impossible-to-destroy Russian KV tanks, and later JS 1 and JS 2 tanks. Problem was, these were fully functional and proven tanks. They were fairly fast on the battlefield, had a good anti-infantry protection and so on. As for the German answer, the model Mause, it was a useless mountain of steel. Its speed was 3 km per hour, had no small arms protection. Germany's navy never really got the respect or support from Hitler it deserved. Led by the fanatical Nazi Admiral Karl Doenitz, the Kriegsmarine played second-fiddle to the Wehrmacht and Luftwaffe throughout the war. Yes, Hitler supported the use of U-boats and wolf-pack tactics, but as a man obsessed with land battles, he never quite groked the importance of establishing superiority at sea. After the war, Doenitz attributed this shortcoming to the loss of the war. Prior to the war, when setting the budget for what was supposed to become the world's largest stadium, Hitler told Albert Speer: "That's less than two Bismarck class battleships. Look how quickly an armored ship gets destroyed, and if it survives it becomes scrap metal in 10 years anyway. But this building will still be standing centuries from now." But Germany, with all its powerful forces on land, did not have the sea power to stage the invasion of Britain. When preparing for the war, Hitler failed to recognize the importance of the British fleet as a significant threat. In the final analysis, it was Allied sea power which salvaged the situation. Indeed, the Second World War was a war of logistics. It's impossible to know what greater success Germany might have had in the Atlantic (or elsewhere), and what further destruction it could have inflicted on Allied convoys, had the German Navy been given even the minimum sea power required for waging a global war. 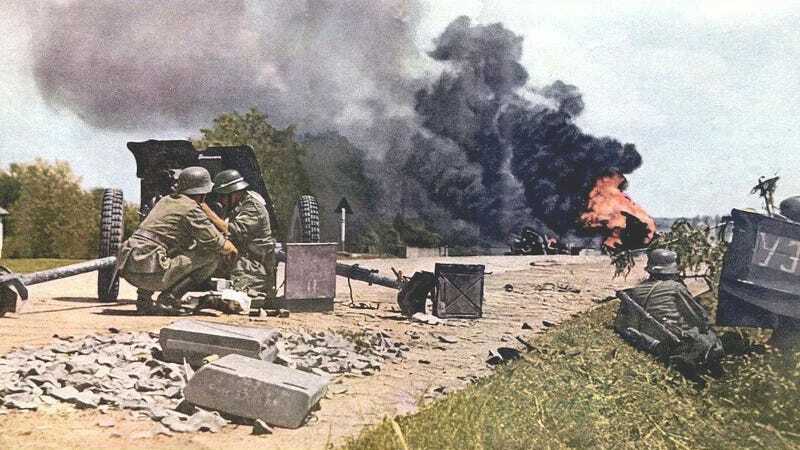 As the Wehrmacht and Red Army fought along the Eastern Front — a region consisting of modern-day Poland, Ukraine, Belarus, Russia and the Baltic states — many of the citizens caught in the middle saw the Germans as potential liberators. Indeed, life under Stalin was no picnic. The regime was heavy-handed, repressive — and murderous. During the early 1930s, for example, Stalin deliberately starved some 12 million Ukrainian peasants in one of history's greatest atrocities. But as the Germans ploughed through a region primed for liberation, they simply replaced one repressive regime with another. As illustrated in Timothy Snyder's Bloodlands, Nazi ideology and racism trumped practicality and common sense. Perceiving the Slavic people as "subhumans" (untermensch), the Nazis could not accept cooperation. Moreover, like the Jews, Slavs were to be uprooted from these lands, replaced by German pioneers (Hitler was very inspired by the North American example). By the time the war was over, the Germans killed 9.3 million people in Eastern Europe (5.4 million of them dying in the Holocaust). The harsh treatment of people in the occupied territories created a super-hostile environment for the Wehrmacht bases of operation. Partisan activity was a constant thorn in the side of the German army, as witnessed by the brutality of Nazi reprisals. Spain was a member of the Axis during the war, but it never committed troops to the effort. Led by fascist dictator Francisco Franco, the country steadfastly refused to enter into the thrall. Spain was worried about cutting its oil imports from the US and engaging in yet another war (the Spanish Civil War still fresh in memory). Hitler tried to persuade Franco, but in return he asked for large quantities of grain, fuel, armed vehicles, military aircraft and other armaments. Hitler was so frustrated he threatened to annex Spanish territory. No agreement was ever reached. Hitler famously told Mussolini, "I prefer to have three or four of my own teeth pulled out than to speak to that man again!" Declaring itself neutral soon after the start of the war, Turkey was concerned about a conflict with the Soviet Union. In June 1941, after its neighbor Bulgaria joined the Axis, Turkey signed a non-aggression pact with Germany. Things stayed like this until 1944 when Turkey declared war on the Axis powers. For Germany, this represented a blown opportunity. Other sources: The Second World War, Stalingrad, Bloodlands, Manstein, The World At War, The End.